We are offering Sage Oil, extracted from herbs that are considered sacred by Obtained from a particular herb that was considered as holy by the locals of Egypt in ancient era, Sage Essential Oil was used to promote fertility in women, This herb is reckoned for its high medicinal values in China. Steam distilled from dried form of the leaves of this herb, this oil has particular spicy smell. Sage Oil contains compounds like Acetylcholine esterase, 1,8-cineole (Accounting for 71.6% of the oil), camphor (24.95%) and a-Thuyune. The top note mild smell of this oil signifies the aroma of herbal oil that has long lasting musty fragrance. Sage Essential Oil can be combined with the essential oils of orange, geranium, vetiver, lavender, neroli, clary sage, tea tree, rosemary and ginger. 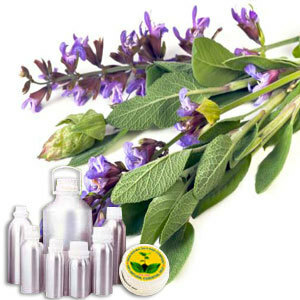 This aromatic oil is also referred as Salvia Sclarea, Salvia Officinalis, Clary Sage and Sage oil. In pharmaceutical arena, Sage Oil is used for its high therapeutic values. This scented oil is reckoned for its anti inflammatory, anti bacterial, antiseptic, anti fungal, depurative, cicatrisant, anti oxidant, choleretic, anti spasmodic and anti microbial attributes. Its aphrodisiac, preservative, antibacterial and digestion promoting properties cannot be denied.